Even though everything is well outlined in the video, I'll add the tools used, and cite the copyrighted stuff. Also here's an img\text tutorial, in case that's more convenient. 1: join flagtrail Discord server, here. Which means, my account will use up to 35% voting weight in flags (about 1.90$ at current prices). No votes will be cast if my voting mana is below 65%. And I will not flag anyone who has 50,000 SP or more. Outstanding work! I know from experience that creating and editing a video tutorial is not trivial task and am thankful you took the time. The flag trail is making a great difference in affecting the viability of abuse on this platform. As we bring more users aboard, Steem abuse will become an increasingly risky and losing venture. Getting the word out is pivotal as well as future innovation. I know that @reazuliqbal has been working on future improvements on the repository as well. Efforts like this will truly help to clean Steem. I'm diggin' that hashtag by the way! Thank you for your review, @anthonyadavisii! Keep up the good work! I've been using flagtrail for about 2 months now, would be amazing if more people would join in! 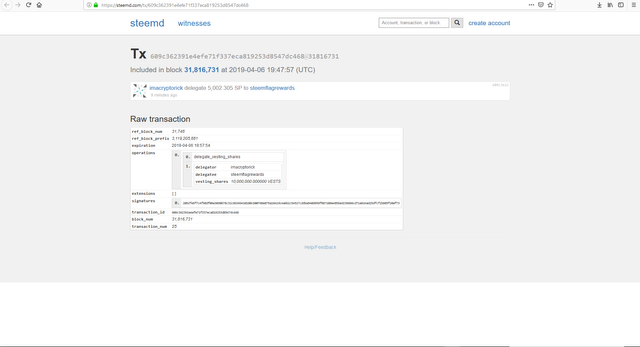 P.s, its great you have delegated 5k SP to @steemflagrewards. That will help them out a lot! Nice work Rick and Reaz! A sign of my dedication to fighting VP abuse. Ohh Thank you for showing more people to join the SFR trail. The bigger we are, the less incentive Spammers will have to Abuse bid bots. I currently have adapted our approval code for the credits and have designed the function that will distribute SFR credits upon payout of a post any of us flagged. The next step is moving that into a bot that will run that job once a day ideally via a cron job and send out a report. We will be using the newly created @sfr-treasury account for transfers and @sfr-token-issue to load it's wallet every month for security reasons. The final component that will be essential before go live is the voting (and potentially downvoting) bot. 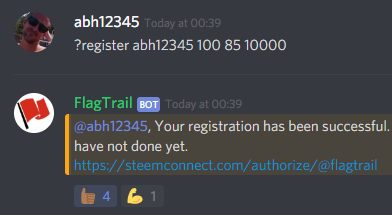 It is recommended we set up a public discord bot that SFR users can issue commands such as $upvote . A big concern I want to ensure is addressed is accountability of voting / ensuring the bot is used responsible. I think having a screening process will be an absolute must. Maybe following the flag trail at some minimum could be something to consider as a criteria. I know if we scale that having our mods reviewing flags and concurrently reviewing content that users want upvoted may not be feasible but I absolutely want more care to be given than a typical voting service. It could be instead the mods perform spot checks and any abuses would likely result harsh enough conseqeunces that users would not dare. If only that were the norm for the bid bots, we would see much fewer abusers with significant influence on this platform but doesn't mean we can't set the example ourselves. Anyways, I am working on playing catch up on our GitHub repository tonight and publishing an update capturing the changes thus far on a Utopian antiabuse contribution. We've made significant strides but got a hell of a way to go. Tagging @steemflagrewards for visibility of other interested parties. There should be a safe and efficient way to prevent abusers from redeeming SFR tokens. Beautiful explanation. It’s been long over due. Actually periodic reminders would be healthy too.